After shooting a hole in one, Rowan Dockum, 2, of Fairfield, marches down the green at the Fairfield Library's mini golf event on Sunday, March 24, 2019, in Fairfield, Conn.
FAIRFIELD — Hundreds of people teed up Sunday morning at the Fairfield Library for some fun on the green. 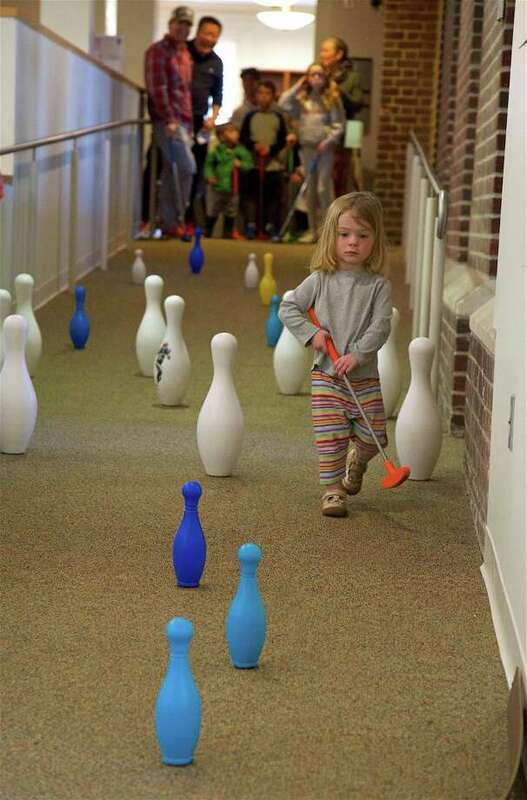 There were 19 holes of miniature golf set up throughout the building, with lines of families taking part in the fundraiser orchestrated by Friends of the Fairfield Library. With putters in hand, kids and adults alike walked the intricate course, which featured a series of obstacles and offered prize awards donated by several sponsors. “This is the third year at the main library,” said volunteer Leslie Shanehan, who explained that two businesses downtown — Saugatuck Sweets and B. Good — were offering discounts for golf participants. “It encourages families to come to the library and then walk around town,” she said.